What Do You Really Know About Rheumatoid Arthritis?? 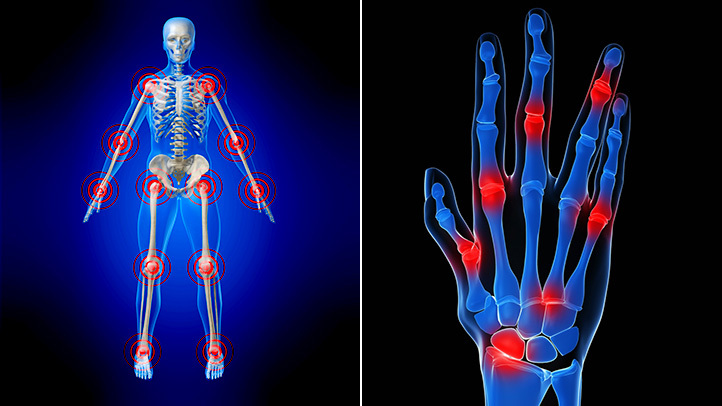 Every patient that has come into our office has heard about some form of arthritis. Whether that is osteoarthritis, arthritis, or the infamous rheumatoid arthritis. But when asked if they knew the difference between them, there is always a slight pause followed by silence. This blog is going to go more in depth about rheumatoid arthritis and explaining what the signs and symptoms are as well as treatment options. Before getting into signs and symptoms let us discuss some basic information about the body. Rheumatoid arthritis (RA) is an autoimmune disease in which the body’s immune system – which normally protects its health by attacking foreign substances like bacteria and viruses – mistakenly attacks the joints. This creates inflammation that causes the tissue that lines the inside of joints (the synovium) to thicken, resulting in swelling and pain in and around the joints. The synovium makes a fluid that lubricates joints and helps them move smoothly and prevents the bones from rubbing each other. Roughly 1.5 million people in the United States have been diagnosed with RA and nearly three times as many women have the disease than men. The most common age groups to develop RA are between the ages of 40 and 60 years old. In the beginning stages of RA the smaller joints are affected first; ie; smaller bones in the hands, feet and in the wrists. As it progresses it may go into both shoulders, elbows, wrists, hips, knees and ankles. There also have been cases of patients having issues with their skin, eyes, lungs, heart and the blood vessels. Typically more than one joint is affected with joint pain, swelling, tenderness, redness, warm to the touch, morning stiffness lasting for 30 minutes or longer, fatigue and loss of appetite. There is no one blood test or specific imaging to confirm if the patient has RA. People with rheumatoid arthritis often have an elevated erythrocyte sedimentation rate (ESR, or sed rate) or C-reactive protein (CRP), which may indicate the presence of an inflammatory process in the body. Other common blood tests look for rheumatoid factor and anti-cyclic citrullinated peptide (anti-CCP) antibodies. A Rheumatoloigist may recommend X-rays to help track the progression of rheumatoid arthritis in your joints over time. MRI and ultrasound tests can help the doctor judge the severity of the disease in your body by checking how much of the bone is damaged, and the narrowing of the joint space. Unfortunately there is no cure for RA but there are different methods in treating the patient. The most popular form of treatment that doctors like to try are some form of medication. Such as some type of steroid, NSAID’s (Nonsteroidal anti-inflammatory drugs), Disease-modifying antirheumatic drugs (DMARD’s) and biologic agents. Common names for any of these drugs are Plaquenil, Humira, Enberel, Methotrexatre and Prednisone. All of these drugs have side effects. It can be from headaches, light sensitivity, liver damage, heartburn, high blood pressure, dizziness, neuropathy, itchy skin, vomiting, diarrhea, increasing the likely-hood of getting an infection in the body and many others. There are other ways you can try and control the symptoms of RA as well as decreasing the amount of “flare ups” the body has. Physical Therapy/Occupational Therapy/Massage Therapy: Patients would be shown how to properly stretch the muscles throughout the body to make sure that the body has the best flexibility it can have. When the body has increased range of motion there is less stiffness and tightness and restoring muscle strength and endurance is easier. The program can easily be tailored to the patient and progression of exercises keeps the body and mind challenged. Anti-Inflammatory Diet and Healthy Eating: There are 7 main things in someone’s diet that should be avoided; Dairy, gluten, soy, eggs, peanuts, corn and sugar. Many people have a hard time digesting and processing these foods which can cause gastrointestinal issues. Drinking water is also an easy way to help detox the body and to get rid of toxins. A person should be drinking at least HALF OF THEIR BODY WEIGHT IN OUNCES OF WATER A DAY!!!! Water helps the body get rid of all the bodies “junk” and if it is not being expelled then it is just sitting in the body doing more harm than good. Supplements and Vitamins: At our office we offer a variety of supplements that can help with RA. Natura is a company name that we recommend often to our patients. A few of our popular supplements are InflamAway, Corydalis Plus, Botanbol, and Thermo-Fit. All of them help increase the metabolism, increasing bone health, relieves minor pain and other benefits. Other recommendations can be using probiotics, vitamin D as well as fish oil. These are recommendations that should be discussed with your doctor to make sure that there are no contraindications and to take the correct dosage. For more information about the brand Natura please go to their website at www.naturahealthproducts.com. For reading this blog you will be able to receive a discount of any of the supplements/vitamins that we have in stock. If you have any questions please call our office at 847-362-4476.